you just have to reinvent yourself. This book is about building strength and hope in the midst of fast-moving, gut-wrenching life experiences that bring us up short and leave us gasping. It’s about making decisions for Change with a capital C, the change for which we’re not quite prepared. 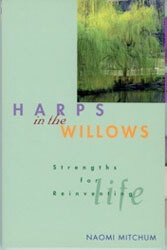 Harps in the Willows, strengths for reinventing life speaks to a wide range of Change from the death of a loved one, loss of job or instant poverty to catastrophic illness, a burned out house, violence and other situations. Sections of the book present guidance on reinventing lifestyle, self, personal theology, holidays, health and wholeness, worship and service to others. Harps in the Willows offers a rich mixture of spiritual, scriptural, and practical guidance for coping faithfully when your life has been turned upside down. This is a book you will turn to over and over again.